USA’s Karen Chen at Icetown in Riverside, Calif.
USA’s Karen Chen brought home her third consecutive Junior Grand Prix (JGP) medal—a bronze—which she won earlier this month at 2014 Czech Skate. She placed a solid first (60.68) in the short program, but underrotated several jumps and fell on her triple-triple combination to finish fourth (100.27) in the long. Chen is skating to “Escala” from Clint Mansell’s Requiem of a Tower for the short program, and music from The Godfather soundtrack for the long. Both routines were choreographed by Justin Dillon and Cindy Stuart. The skater previously used “The Godfather” for her long program when she was a novice. “The music is quite strong and fierce, so I am working on my facial expression to engage everyone’s attention,” said Chen, adding that she feels her artistry has improved since last year. Last season, Chen placed third and first at her JGP events in Latvia and Slovakia, respectively, but then broke her right ankle and had to withdraw from the JGP Final. However, it only got more complicated. Recovery wasn’t as easy for the skater as she first thought. The skater, who is competing as a senior this year domestically, placed fifth in the short program at the 2014 US National Figure Skating Championships, but then had to withdraw. Gambill said Chen was very determined to try and get ready for nationals, but she just didn’t have enough time to get fully prepared. Chen recovered enough to compete at the 2014 World Junior Championships in Sofia, Bulgaria, where she finished a respectable ninth overall. 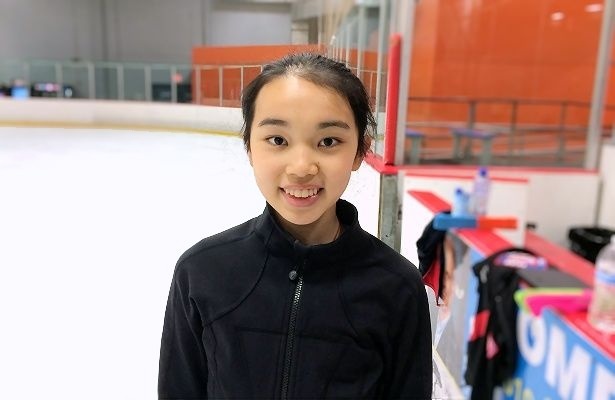 This year, Chen’s goals are to land consistent triple-triple combinations, and she would also like to start working on the triple Axel again. Over the summer, Chen took a week to visit family in Taiwan where her grandparents and most of her aunts and uncles live. The high school sophomore can speak and understand Mandarin fairly well, but is unable to read or write it. “Since both my parents are Taiwanese, I understand Taiwanese, but can only speak a little of it. One of Chen’s favorite pastimes is to cook with her mother. Chen’s other passion is art and has several of her works on display at her website. Chen will compete at her second JGP next month at the 2014 Croatia Cup 2014 in Zagreb. Miki Ando (JPN) became the first woman to land a quadruple jump (Salchow) of any kind at the 2002-03 Junior Grand Prix Final. In 2001, USA’s Sasha Cohen landed a quad Salchow in warmup and practice at Skate America, but aborted the attempt in her long program. Between 1989 and 1992, Surya Bonaly of France attempted several quads, but she fell on one attempt and the others were underrotated.